The owners of this brand ended their partnership with the Cozy Partners affiliate program. They've received years of player referrals and now get out of paying commission as agreed. They've breached our initial contract and there's no confirmation that they plan to transfer to a new affiliate program. Please select an alternative bingo site with a reputation for honoring its business and player agreements. Get your hand caught in this cookie jar and you may just pull out a massive chunk of cash. Bingo Biscuit is a great accompaniment to your tea party. Making their way into the online market in 2013, Biscuit Bingo brings another site to add to your favorites list. The web design is got a silly concept, but in a good way that might give you a chuckle featuring a chocolate chip biscuit that comes to life and waves as you drop by. As part of the Best Bingo Network they come from a good stock of brands offering the integrity players can trust. Cozy Games software supplies the platform with a full range of Bingo and casino products and is a veteran in online gaming. iTech Labs, an independent auditor test the RNG for fairness of all games. The C.O.M.O.D.O icon is your assurance of an authentic and secure site that is licensed and regulated under Malta jurisdiction. If you are hungry for a wide variety of Bingo options your appetite will be quickly satisfied with 4 Bingo options including 90, 75, 80 and speed 30 ball Bingo. While away from home convenience allows you play in their Mobile application. The rooms are generally very active with players offering a Jackpot prize across the each live room. Chat Games are a way to earn valuable Bingo Bucks that are playable on all gaming. Progressive Slots and Video Slots feature up to 50 paylines starting at 1p per line. Players are in the know of the latest favorites that are indicated by the Hot Pick symbol. Some of these favorite Slot titles include Hot Habanero, Party Night, Wild Vegas and Honey Bees. Table Games, Video Poker and Scratch Cards are also offered. There is no purchase necessary to give the games a test run with the No Deposit Bonus offer. 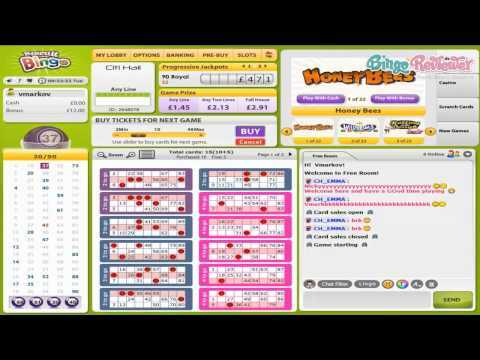 Simply register an account, verify your email and the Bingo Bucks are placed in your account straight away. There are plenty of Bonus offers to keep your bankroll fueled starting with your first deposit once you have made the minimum £10 required. After you successfully accomplished your first three deposit a Reload Bonus is available from your 4th deposit on. Special exclusive Bonuses are also awarded throughout the month. Monthly Offers have lucrative incentives that change every month with hot specials like Guaranteed Jackpots, Slots and Bingo specials. It is a fun all around atmosphere, exactly what it should be for exciting gaming. Bonus lovers will appreciate the Reloads on all deposits and the Bingo game variations are a solid plus. We rate Biscuit Bingo with 4 Pink Hearts. Biscuit Bingo is among the top of my list of favorite gaming sites. Upon joining, I was most impressed with their wide assortment of bingo games. They give you plenty of variations to choose from, including 30, 75, 80 and 90 ball games. This is definitely one of the biggest things I look out for when it comes to playing at a new site and they really go all out here! I don’t know about you, but I often need a break from a particular bingo variations and so I like to switch it up here and there. This site allows me to do just that. Their welcome offer isn’t bad either. As a new player, you start off with £20 free, with no deposit required. In addition to that, I was also able to benefit from 300% worth of deposit bonus on my first three deposits. Not a bad deal!